RETREAT Announcement: With deep regret, I have to announce that we must cancel our crochet retreat scheduled for Feb 27-Mar 2. We simply did not get enough registrations for either the retreat itself or for individual classes to make the retreat a possibility this year. We are very sorry to disappoint everyone who registered and was looking forward to this event. We were really looking forward to spending time with all you in person. I will be issuing full refunds to everyone today. 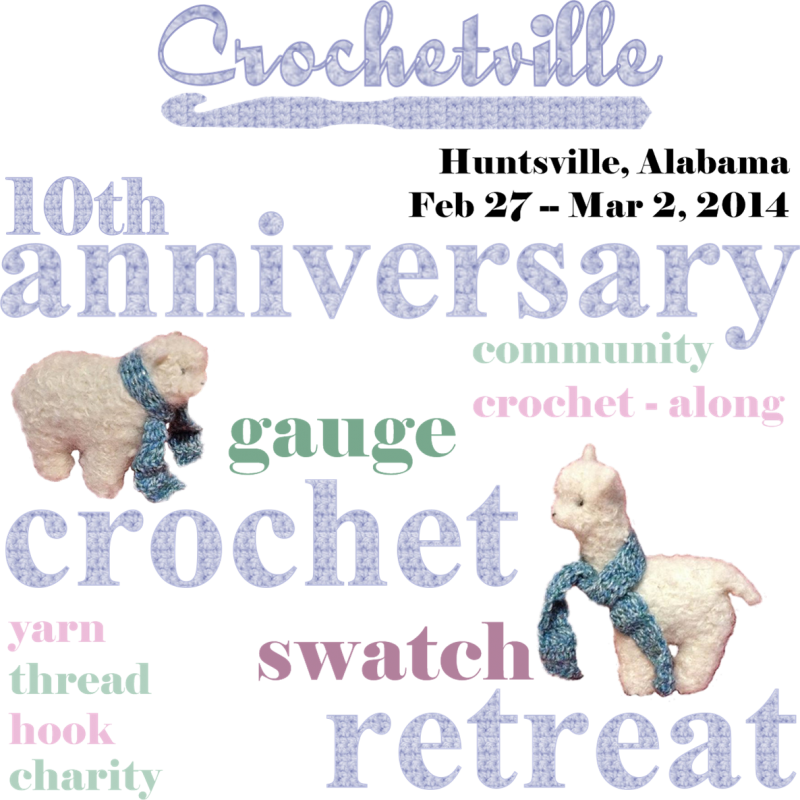 Can you believe that February 2014 will be Crochetville’s 10th anniversary? In recognition of this momentous occasion, we are hosting our first ever crochet retreat! Come join us in Huntsville, Alabama February 27 through March 2, 2014 for a weekend full of crochet awesomeness. The registration booklet with complete details is available for download at the end of this post, but here’s the basic information you need to know. When you register, you’ll also have the option of ordering crochet books written by our instructors. You can pick up your books at the retreat and get them signed by the instructors. We also hope to have retreat swag available to pre-order in January, such as t-shirt, mug, and tote bag all featuring our retreat logo. If you've been planning on attending our retreat, don't forget to submit your registration before Early Bird discount pricing ends on December 31. We'll be making a decision the morning of December 31 whether we have enough people registered to hold the retreat. If we don't, we'll issue full refunds to everyone on the 31st. We don't want to cancel, so get those registrations submitted on or before December 30 if you possibly can. We have a lot of fun events planned for the retreat, and we really want a chance to get together with a bunch of you for a whole weekend full of crochet fun. We have a number of famous teachers coming in to teach some fabulous crochet classes. But if you're on a more limited budget, you can register for the retreat without taking any classes. We'll have informal help and "Ask the Stitch Doctor" sessions going on in our main Sit and Stitch area. I hope I'll see you at the retreat! Is the retreat still on? I haven't heard if we got enough to sign up in order to still hold the event. A few of us have been trying to contact Amy but have not heard back. Just wanted to make sure we were still going. Hope to see everyone there! Amy has posted about it on the facebook page, that is mainly where i have seen updates anyway. They moved up the early bird deadline to Jan 15 i think, to try to get enough signups. We're giving it until January 15 to make the final decision. We're very, very close to making this happen! Sorry I forgot to post the extension here. Oh, early bird prices are extended through January 15. If we go ahead with the retreat, any registrations from January 16 through January 31 (last day to register) will be at the higher price. If you have made hotel reservations already, please remember to cancel them.